GCCRMP members “treasure hunt” for macroinvertebrates on their transect in Achang Reef Flat MPA, April 18, 2014. Credit: Marybelle Quinata, GCCRMP. 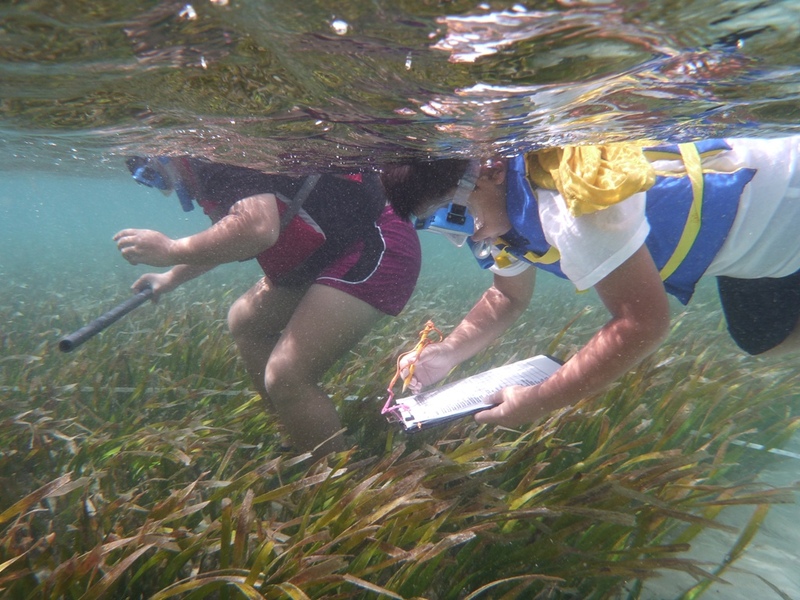 Launched in 2012, the Guam Community Coral Reef Monitoring Program (GCCRMP) helps Guam residents get actively involved with coral reef management. GCCRMP’s monthly open training sessions and monitoring events bring community members together to collect data about the health of our coral reefs and understand the importance of protecting them. This year, GCCRMP will expand its Adopt-A-Reef network. 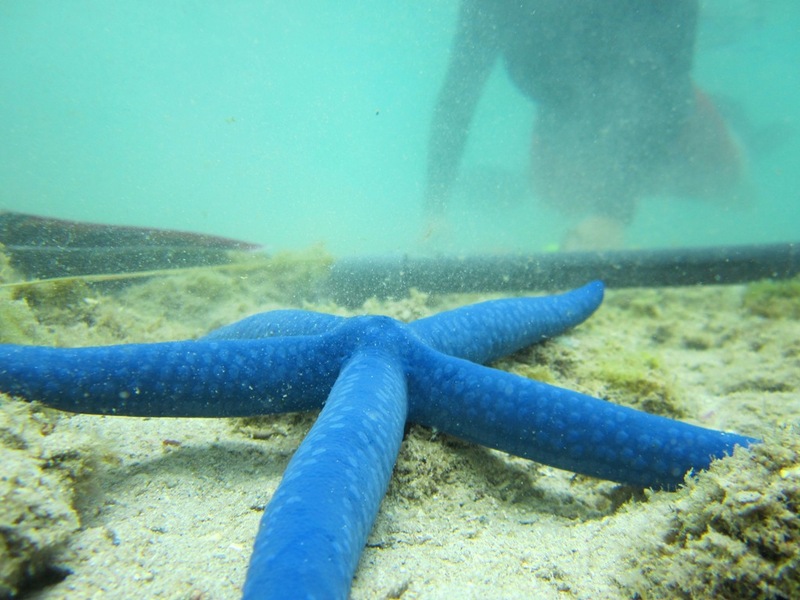 Through this initiative, different community groups can lead coral reef monitoring efforts at their adopted site, such as a family beach or favorite snorkeling spot, and organize other activities that encourage environmental stewardship. 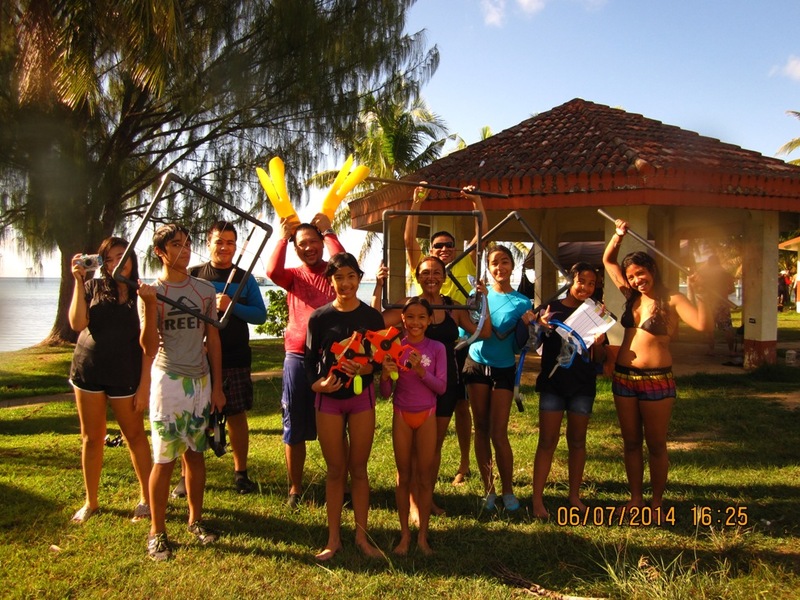 The Marina Mania club of George Washington High School and Umatac Coral Reef Ambassadors are the first two groups to “adopt a reef” in their respective villages. The Adopt-A-Reef network can strengthen partnerships among community groups who support each other by sharing their group’s stewardship activities and lessons learned with one another. Our hope is that growing the Adopt-A-Reef network will keep Guam residents involved and instill a sense of responsibility, collective ownership, and most of all pride in Guam’s marine resources. Earlier this summer, GCCRMP began working with the Merizo community. Merizo residents participated in community monitoring training located within the Manell-Geus watershed. This watershed was recently selected as a focus area for NOAA’s Habitat Blueprint, an effort to foster healthy habitats that sustain resilient and thriving marine and coastal resources, communities, and economies. Monitoring reefs with the GCCRMP, residents gain first-hand knowledge of their local reefs and the threats that affect the health of their reefs. Members are empowered to share their knowledge of reef impacts among their classmates, relatives, and fellow village residents. GCCRMP will also include socioeconomic monitoring starting with the Manell-Geus watershed. Combined with biological monitoring data, information on how people value and use their reef resources can open productive communications between residents and the government. In turn, this can help the community group raise awareness and develop actions that residents and the government can take to protect reefs. 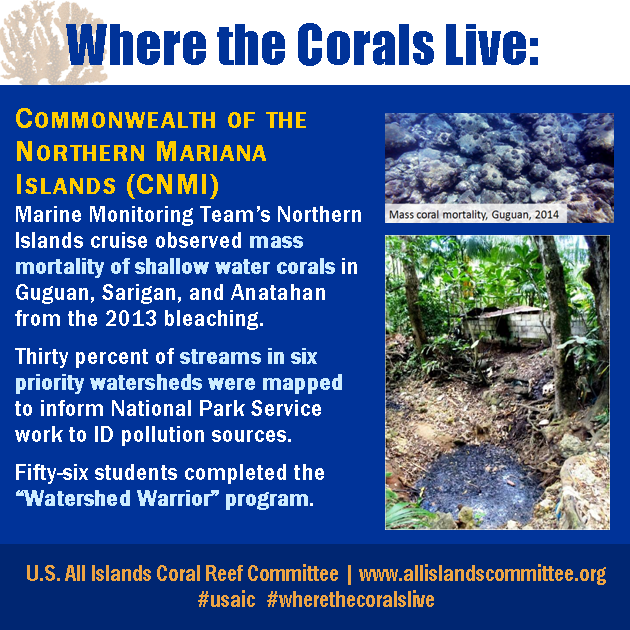 For more information on GCCRMP, visit guamreefmonitoring.wordpress.com, like us on Facebook, or email us at gureefmonitoring@gmail.com. The AIC would like to shout “CONGRATS!” from the rooftops to Gerry Davis and Bob Richmond, PhD, our resource management and science advisors, respectively. 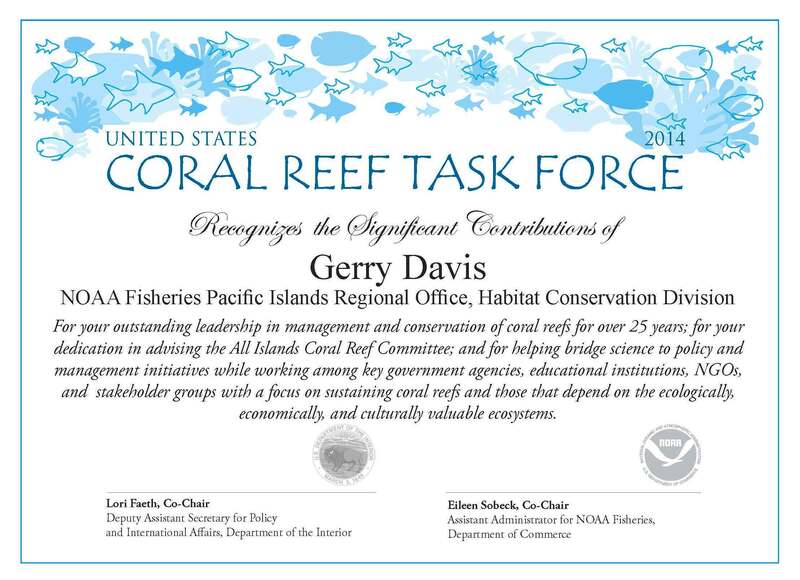 During today’s Business Meeting at the 32nd U.S. Coral Reef Task Force, Gerry and Bob received awards recognizing their significant contributions to coral reef science, management, and conservation throughout the years. CONGRATULATIONS, again, to Gerry and Bob for receiving these awards! Thank you to the Task Force for recognizing our excellent Advisors. 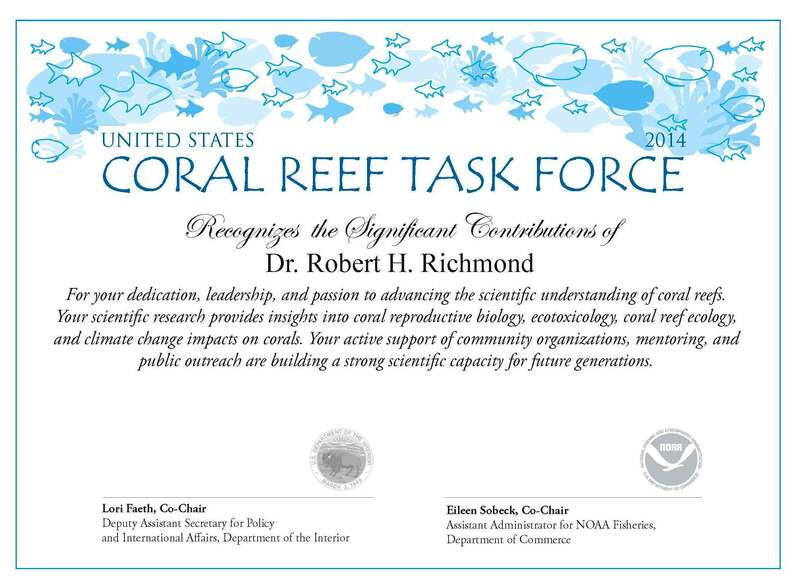 Indeed, each one of our AIC Advisors are more than deserving of such recognition for their decades of work in helping conserve our nation’s coral reef ecosystems. The AIC greatly appreciates the time and energy that our Advisors give so willingly to help us all work towards this common goal. 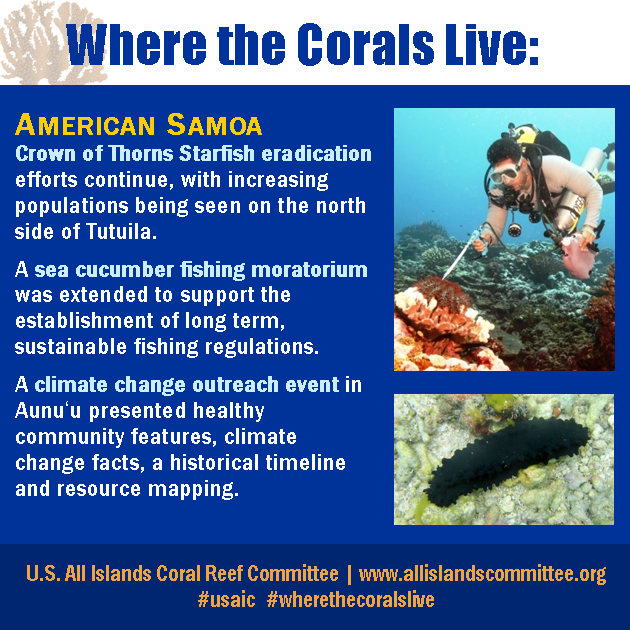 The AIC is headed to West Maui, HI to participate in the 32nd U.S. Coral Reef Task Force (USCRTF). 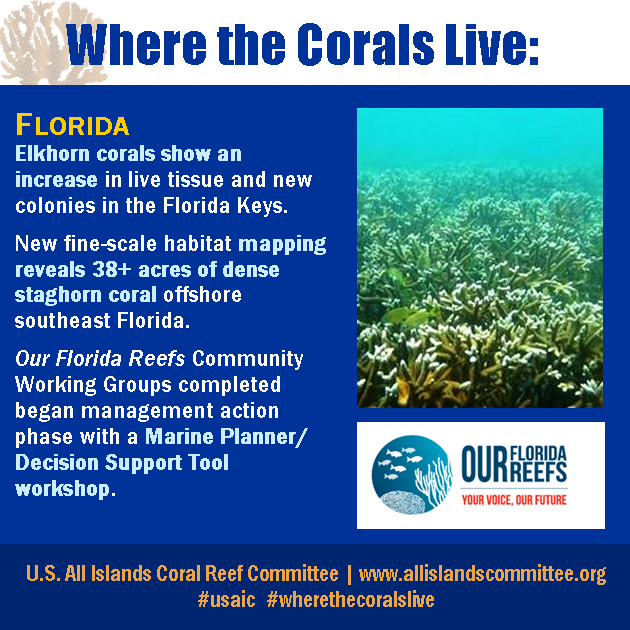 Every other meeting is held in a jurisdiction, which is particularly helpful as they allow participants from all over the country to see, first hand, techniques, projects, resources, and tools being applied in coral reef ecosystem management at the local level. This meeting will be held within the West Maui Watershed, one of the priority watersheds of the USCRTF. The AIC is starting off the week a bit early (working through the weekend!) with an AIC Strategic Planning Retreat on Saturday and Sunday. The AIC Meeting will take place on Monday, September 8th. The rest of the week is packed to the gills with working group meetings, site visits, workshops, a Steering Committee meeting on Wednesday, and public Business Meeting on Thursday. Stay tuned here and on our Facebook page for updates throughout the meeting!